Released in March of 2009, this PG-13 horror movie took the mainstream theater-going crowd by storm. It seemed that everywhere you looked there were advertisements for The Haunting in Connecticut, featuring quick, jarring shots of various creepy, CGI effects. 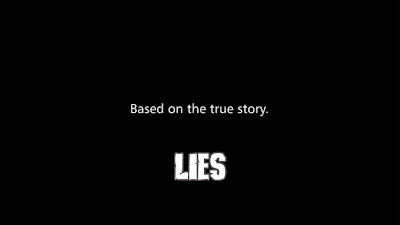 Not pulling any punches, the marketing campaign was quick to claim that the events in the film were based on a true story, attempting to lend an air of credibility to the proceedings. It seemed to work because, as I recall, the buzz around this film was high on good feelings for at least a couple of weeks. The box office was relatively good, especially during what was otherwise a slow season. The claim that the events that transpire during The Haunting in Connecticut's 92 minute runtime are based on actual events are dubious at best. The film is based on a book, In a Dark Place, written by Ray Garton whom which has gone on record as saying the depiction of events offered in the book were intentionally exaggerated. But really this comes as no surprise. Anyone who has followed the horror genre knows that claims of being based on a true story is nothing but a gimmick of the most rudimentary type. Sorry to disappoint. Taking away this air of truth that the filmmakers would have the unsuspecting, general movie-watching public believe, and we're left with a fairly generic, paint-by-the-numbers haunted house story. The general plot follows middle-aged mom, Sara Campbell (Virginia Madsen), as she attempts to deal with the impending death of her cancer-ridden teenage son, Matt (Kyle Gallner). In order to help lessen the amount of time spent traveling, Sara and her alcoholic husband arrange the funds necessary to rent a house closer to the hospital where Matt receives treatment. Given that the family is strapped for cash, and as always seems to happen in movies of this genre, the family lucks into finding the perfect home with extremely affordable rent. This, of course, is due to some mysterious and sordid past that will become clearer as the movie progresses. The beginning of the film is rather effective in keeping the audience off-balance, attempting to represent itself as psychological thriller. Initially, the ghostly manifestations are painted in a way that brings the sanity of the near-death son into question. Unfortunately, I cannot help but feel that these interesting attempts at creativity are completely undermined by the film's marketing campaign. The commercials were focused so heavily on special effects and paranormal activity that there was never any doubt that this approach was nothing more than a red herring. My biggest complaint about this film is how manufactured and forced the entire production feels. This feeling isn't limited to the scares and general horror atmosphere, although it is most noticeable there. For instance, there is a mysterious religious figure with a dark past who has crossed paths with ghosts and demons in unexplained previous encounters. They're trying hard to recall fond memories of Father Merrin from The Exorcist with this character, but never comes off feeling like anything but a rip-off. 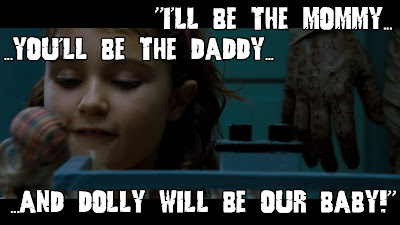 The writers would have been served the film by introducing characters based on the ghost-hunting husband-wife team of Ed and Lorraine Warren, whom investigated the real case on which the film is based. At the very least this would have changed the dynamic between these deus ex machina, knowledge-possessing characters and our protagonists. Another aspect of the film that bothered me was the opening sequence, which consists of a short scene where the mother is recounting why the family decided to move into the haunted home. This scene is presented mock-documentary, going so far as to include a boom mic in the camera shot to reinforce how "real" this type of presentation is supposed to feel. Outside of the first two minutes of the film, this particular narrative device is never seen nor referenced again. The exposition delivered here is nothing earth shattering and is all established easily enough in the next few scenes of the movie proper. In the end, this framework feels unnecessary and extraneous to the rest of the film. Other parts of the movie feel equally uninspired. The subplot regarding the father's alcoholism is predictable and never leads anywhere interesting. It serves a source of tension between the wife and husband, but due to the quality of acting and lack of chemistry between the characters, the audience never really cares about their familial plight. The same goes for the dying son whose condition steadily worsens as the movie goes on. Symbolically, Matt is literally moving towards death's door as he uncovers the history of the house and the spirits contained within. When the climax of the film comes and the house is cleared, it is hardly surprising when it is revealed that Matt has been miraculously cured of his disease. At times the heavy handed scripting in combination with the wooden acting makes this film feel like a larger-budget made-for-TV-movie. The strongest aspect of The Haunting in Connecticut is the film's striking visuals. The house and the furniture within are suitably old are genuinely creepy, becoming a character in and of themselves. In addition, the CGI effects are put to good use and are effective at generating scares. One scene involving a sinister shower curtain is likely to stick with some viewers even after the end credits roll. Another of my favorite effects are the tendril-like ectoplasm secretions, which are amongst the best visual representations of this phenomenon within recent memory. Finally, some of the ghostly imagery that occurs in the climax of the film is well-beyond what most other horror films in PG-13 territory dare to show. 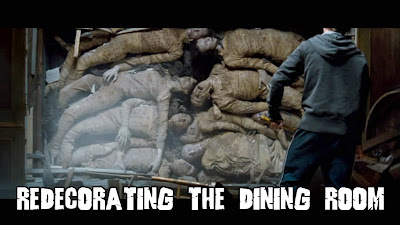 Watching Matt take apart the wall in the family dining room only to reveal dozens of mutilated corpses lining the room is genuinely disturbing imagery. The Bottomline: The Haunting in Connecticut is a paint-by-the-numbers horror film that has a designed-by-committee feel running throughout its content. The visuals are the one component of the movie where the filmmakers decidedly succeed and the film may be worth a watch if only to view these effects. This isn't a bad film, but there are many better options with similar themes (Poltergeist, The Exorcist). Two Bruces. Despite all of the obvious short comings of the film that were blatantly apparent in the trailers I watched it. I kept thinking to myself I know this and have seen it before. Then it struck me. This very story had been done a television show called "A Haunting". After that I checked out and couldn't connect with a single thing. Only reason I finished it was the wife was watching and had no knowledge of the TV show. I would have given it one Bruce. Completely unoriginal and in may ways just plain unnecessary.